If you’re taking a long, hard look at your Toronto home’s windows, and thinking they need to be replaced, you’re probably right. Did you know that old, inefficient windows can actually increase your utility bills? Over time, windows can warp or shrink, which loosens their seal, allowing air to move freely in and out. Your windows have one important job: to keep the exterior airflow outside of your interior living space. So, if you notice drafts, they are an issue that should not be ignored. As all Toronto homeowners know, a single year can bring everything from humid summers to bitter winters, and your windows must be able to withstand this extreme weather. Any of our associates here at Brock would be delighted to recommend the windows that will work best for the needs of you and your home. We only carry windows that provide optimum performance for our climate and weather. You can be confident in our vinyl replacement windows, which provide superb energy efficiency. Our vinyl replacement windows have built-in weatherproof abilities against rain, wind, sun, and snow. Best of all, Brock’s Toronto vinyl replacement windows require virtually zero maintenance. Vinyl windows will never need to be painted or stained, and they come in a variety of colors! Best of all, caring for your new vinyl windows is a breeze, as they need only an occasional wipe-down with soap and water to stay looking good as new. Vinyl windows will enhance the beauty and curb appeal of your home, which is a huge benefit if you plan to resell your home. As energy costs slowly continue to climb, homeowners are seeking out more ways to make their homes more energy efficient. The higher your vinyl windows’ energy efficiency, the more money you will be able to save on your monthly heating and cooling costs. 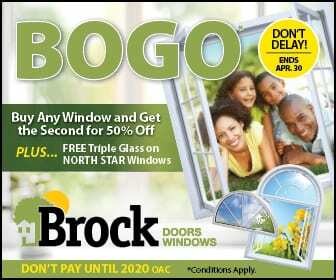 Here at Brock, we provide Energy Star approved windows, which are proven to be top-of-the-line in energy efficiency. Vinyl windows are an amazing choice if you want a window that is durable and long-lasting, and won’t rot, rust, scratch, or corrode. Also, many vinyl windows today are made with a tilt-in feature for easy cleaning. No matter which way you look at it, vinyl windows from Brock are an excellent investment in your Toronto home. Here at Brock Doors and Windows, we make it our priority to give each and every customer the best window replacement options for their home. We’d love to be a part of your replacement windows project. Call us today to schedule your free, in-home consultation!